Today we left Mexico behind! It was an easy place to start cycling from as the roads were flat. Starting off from touristy Cancún we made it down to more rural townships and tried to communicate in broken Spanish with the friendly locals. Luckily it was mostly cloudy and rainy when we were on the bikes (but also when we were off them…). Our bikes have been doing very well, but we have been suffering the usual aches: headaches, backaches, saddle soreness, heat rash, chafing, sunburn, mosquito bites, difficulty sleeping in the heat at night, etc.. Takes some getting used to, both the different climate and sitting on a bike for hours each day! I haven’t been feeling very excited the past few days, probably because of those physical issues and the fact that each day was the same in terms of riding along a highway with the same “view” (aka trees and rubbish). We did pass some nice little villages and the people were really friendly and welcoming, frequently honking to greet us. It was a bit of a hassle at the border as we didn’t have the receipts from our flights to show that the tourist (idiots?) fee was included in the airfare, so we had to find an Internet cafe to retrieve it and didn’t have to pay 300 pesos each! 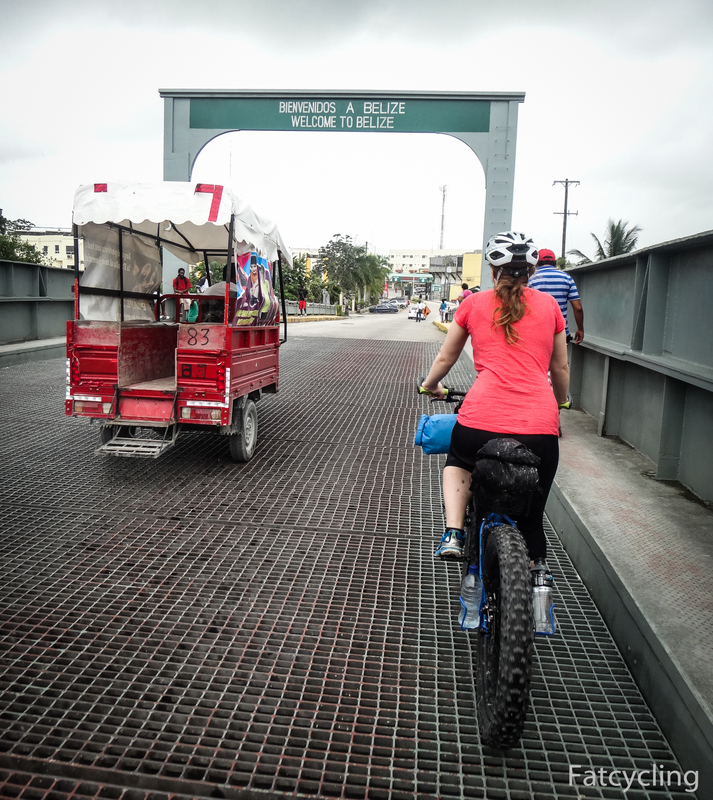 The minute we cycled into Belize it felt like we had entered another country, and it felt good, the highway had turned into a simple road which makes it tricky to cycle next to another and we have to be more aware of the cars around us but it’s a good feeling. We cycled to the first town, Corazol, and are looking forward to things getting more interesting as we go. At least in Quintana Roo, you should not drink tap water as it is highly chlorinated. 4l cost around 10 pesos. We spent on average 140 pesos for food each day, that is for 2 cycling people, not buying any fancy extras or eating out (we ate “out” once for 9 pesos per quesadilla). Great post Gina. I was reading about Corazol as it was 40 years ago in the diary from my trip in 1973. I found it to be a tiny town but fascinating with timber homes and big barrels to collect rain water. I noted how nice it was to see some signs in English!